Batiaghata Upazila (Khulna district) area 248.32 sq km, located in between 22°34’ and 22°46’ north latitudes and in between 89°24’ and 89°37’ east longitudes. 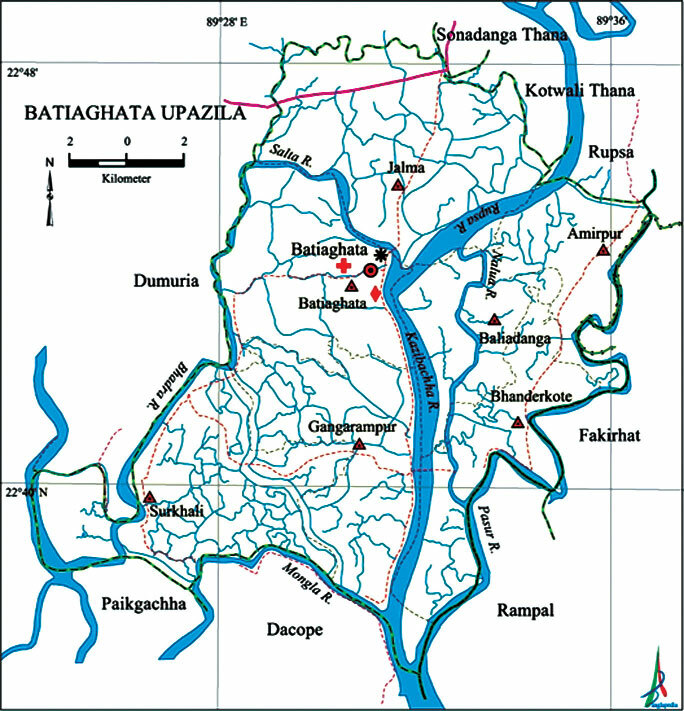 It is bounded by Kotwali and Sonadanga thanas and Dumuria upazila on the north, Dacope, Paikgachha and Rampal upazilas on the south, Rampal, Fakirhat and Rupsa upazilas on the east, Dumuria and Paikgachha upazilas on the west. Population Total 140574; male 72717, female 67857; Muslim 79301, Hindu 60894, Buddhist 285, Christian’ 9 and others 85. Water bodies Main rivers: Kazibachha, Shoilmari, Jhapjhapia, Pasur, Rupsa; noted canals: Aria, Batiaghata and Halia; noted beels: Jhalma, Jhalbari, Basurabad, Ginirabad and Bhatgati. Administration Batiaghata Thana was formed in 1892 and it was turned into an upazila in 1984. Marks of the War of Liberation Mass killing site 1 (Gollamari), memorial monument 1. Religious institutions Mosque 123, temple 84, church 1, pagoda 1. Literacy rate and educational institutions Average literacy 53.18%; Male 58.84%, female 47.21%. Noted educational institution: Khulna University (1991), Batiaghata College (1973), Shahid Abul Kashem College (1995), Boyarbhanga Biswambar Secondary School (1945), Chakrakhali Secondary School (1957), Batiaghata Headquarter Government Primary School (1973), Phulbari Senior Madrasa (1937). Newspapers and periodicals Monthly: Upazila Darpan (defunct periodical), Rashni, Annesha. Cultural organisations Club 20, library 2, women’s organisation 1. Main sources of income Agriculture 57.45%, non-agricultural labourer 8.72%, commerce 13.21%, transport and communication 4.63%, service 6.45%, construction 1.69%, religious service 0.22%, rent and remittance 0.16% and others 7.47%. Ownership of agricultural land Landowner 52.46%, landless 47.54%; agricultural landowner: urban’ 62.19% and rural 51.92%. Main crops Paddy, oil seed, vegetables. Extinct or nearly extinct crops Jute. Main fruits Mango, coconut, betel nut. Fisheries, dairies and poultries fishery 1000, dairy 185, poultry 85. Communication facilities Pucca road 199 km, semi-pucca road 296 km, mud road 296 km; waterways 189 nautical miles. Extinct or nearly extinct traditional transport Palanquin, horse carriage, bullock cart. Noted manufactories Rice mill, saw mill, ice factory, brick-field, bidi factory, shoe factory. Cottage industries Goldsmith, weaving, blacksmith, potteries, bamboo work, cane work. Hats, bazars and fairs Hats and bazars are 50, most noted of which are Hatbari Hat, Kutir Bazar, Kaiya Bazar, Bara Aria Hat, Baintala Bazar, Joypur Bazar, Sadal Bazar and Katianangla Bazar. Main exports Prawn (Galda and Bagda). Access to electricity All the unions of the upazila are under rural electrification network. However 9.83% of the dwelling households have access to electricity.